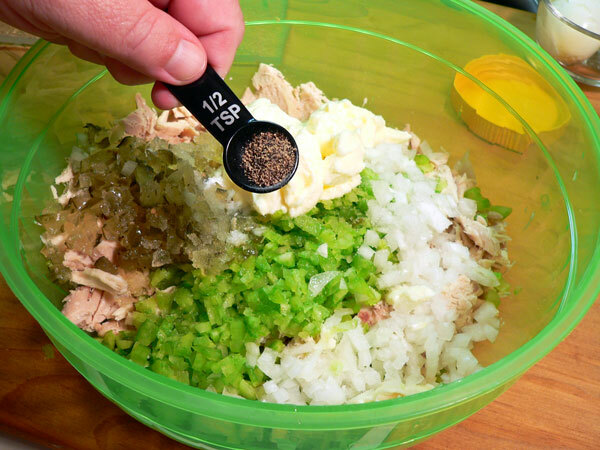 Follow these step-by-step, photo illustrated instructions for making our old-fashioned, homemade Chicken Salad recipe. We’re making it from scratch, the way mama use to make it and you’ll find it’s pretty simple and easy to do. It’s a true southern cooking favorite that makes a great sandwich for a quick and easy meal. Printable recipe included. One of the things I always loved to see mama place on the table was her homemade Chicken Salad. I loved it… just loved it. She always made a great big bowl of it several times a month. It took a prominent place on that oval table most every Sunday and I always enjoyed sandwiches the next day, if any of it happened to be left. Did I mention that I loved it? As good as mama’s Chicken Salad was, one of my fond memories of this dish growing up took place before I became a teenager. We lived about two miles from the middle of downtown for our city. Most Saturdays, mama would have me “call a cab” (taxi) to take us downtown for an afternoon of shopping. On a good Saturday, mama would give me enough money to visit one of the local Drug Stores while she went shopping in the ladies clothing store. This particular drug store had a small area where they sold the best Coca-Cola I’ve ever tasted and a very tasty chicken salad sandwich. The Coca-Cola was served in a cup with very finely crushed ice and a small straw. They never put lids on top as I recalled. The soda fountain wasn’t very large but I will always remember how great those Coca-Colas and their sandwiches were to me. The Chicken Salad sandwich would be served on toasted bread with a scoop of the meat pressed in between. Then, they would wrap it in wax paper, place it in a small brown bag, and I’d be out the door. Most of the time I’d just stand outside the store enjoying my cold soda and that delicious sandwich as other folks walked by. It was so very good, especially to this youngster. Mama’s chicken salad was a bit different. She would always make it using her own special sweet pickles and the juice from the pickle jar. I”m fully convinced it was those pickles and their juice that made many of mama’s dishes so very special to us all. It was very sweet and she used it in her chicken salad, potato salad, deviled eggs and other dishes. I’ve said it before but, I keep thinking maybe one day we can actually bring mama’s sweet pickles to market. They were just that good to me. So, I do hope you’ll give our recipe for Chicken Salad a try. There are a ton of recipes for making it all over the internet with all types of variations. We grew up pretty simple I guess so ours may seem pretty basic. It’s just the way I like it and I hope you will too. Ready to get started? Then… Let’s Get Cooking. 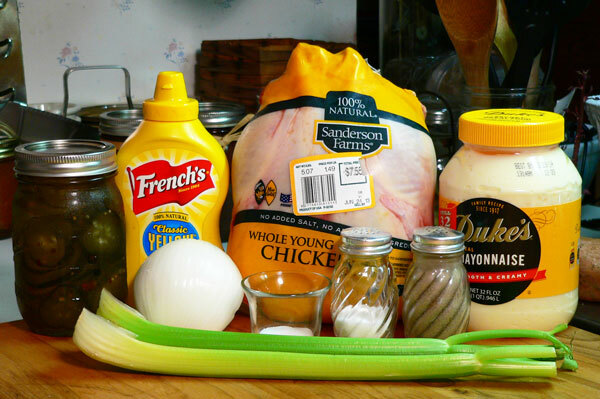 Southern Chicken Salad Recipe: You’ll need these ingredients along with one boiled egg. You’ll need some cooked chicken of course. I covered the basic process of boiling chicken in my Southern Chicken Pastry recipe that I posted here on Taste of Southern. If you need some more instructions on doing that, check out that information here: Southern Chicken Pastry Recipe. I cooked a whole chicken and used half to make the pastry and the other half for this Chicken Salad. This is probably about four cups of cooked chicken all together. 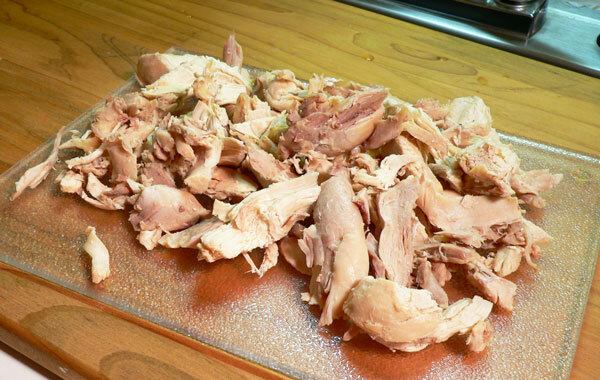 Cut the chicken up into small pieces. You can make this as chunky or as fine as you like. You could even pulse it a few times in your food processor if you wanted. I like it a little more along the chunky side so I just chopped it up with a knife. Place the cutup chicken in a large mixing bowl… something with plenty of stirring room. 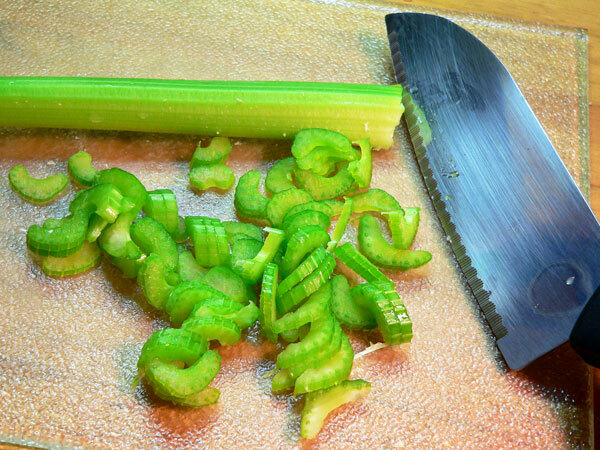 Wash the celery stalk under cold water and slice it into very thin slices. 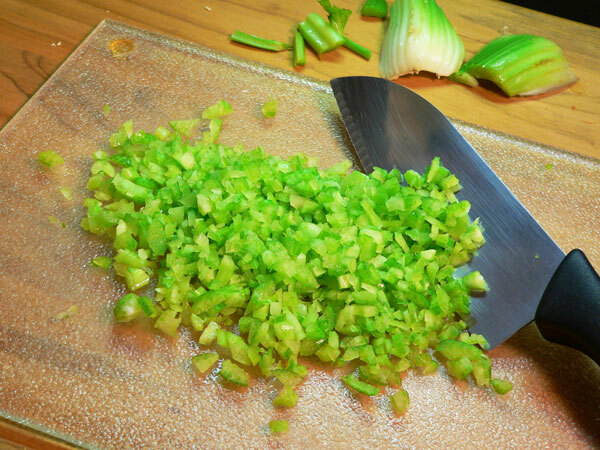 Chop the celery up into a small mince size. 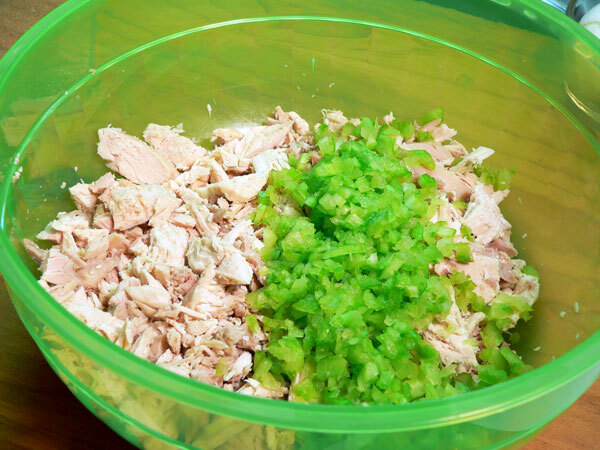 Place the celery in the mixing bowl with the chicken. Dice up the onions and the pickles. These are sweet pickles that I make each year using mama’s recipe. They are very sweet and have been a family favorite forever. 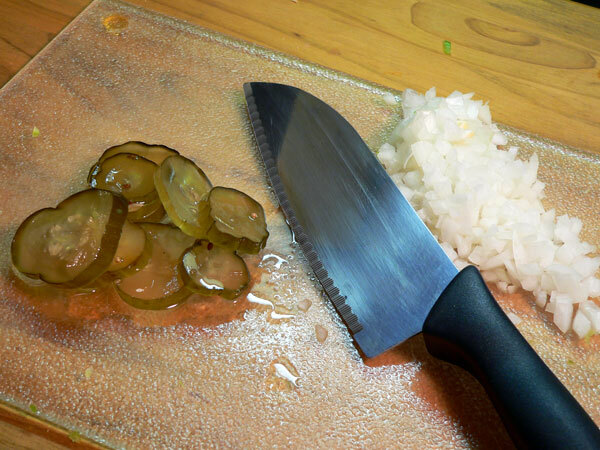 If you don’t have sweet pickles, use a sweet type pickle relish instead. I also pour some of the juice from the jar into the mixture. Place the sweet pickles (or relish) and the onions in the bowl. Add the Dukes Mayonnaise. 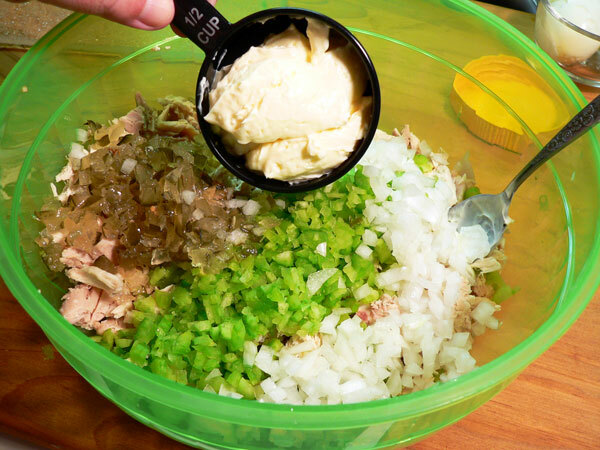 You might want to start out easy with the mayo and, add more later as you see you need it, to get a good consistency. You could add a little sugar if desired, kind of depends on how sweet your relish or pickles might be. Again, you can always add this at the end once you get it all mixed together if you decide you want it. You’ve probably heard me say it before but, mama added a little sugar to almost every thing it seems. 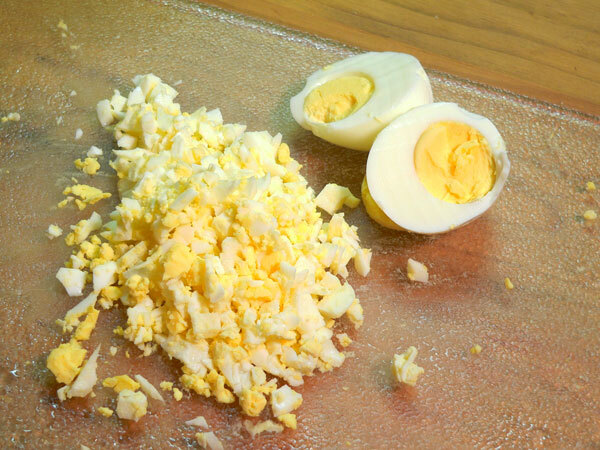 Chop up one boiled egg into very small pieces. I could never just boil one egg at a time so I have the other one with a little salt and pepper while I’m working. Add the boiled egg. I think mama made it sometimes with and, sometimes without, the egg. Stir it all up really good. Now’s the time to do a taste test and see if you need a little more salt, pepper, mayo or anything else. It will get a little more moist after its been in the refrigerator for awhile. 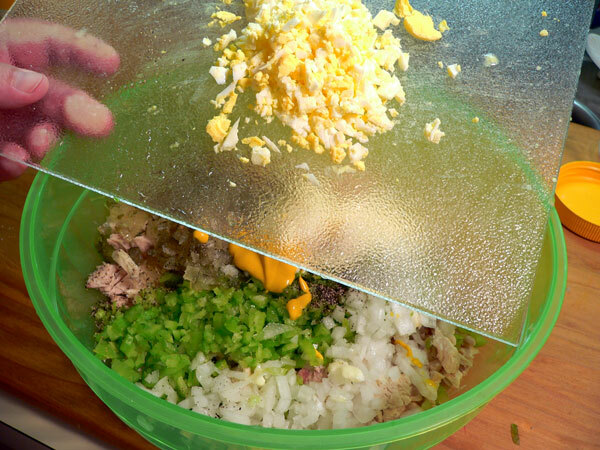 Cover the Chicken Salad and refrigerate it for an hour or two prior to serving. This will allow the flavors to come together better. Chicken Salad will keep in the refrigerator for a couple of days if covered and properly cooled. 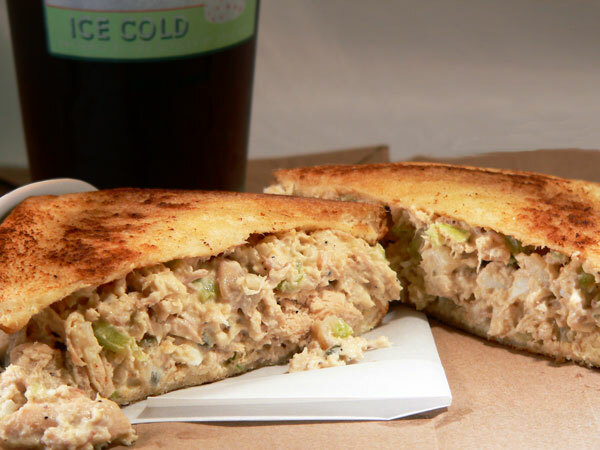 Serve it as a main dish item, on a bed of lettuce or toast up a couple slices of bread and enjoy a delicious Chicken Salad Sandwich. 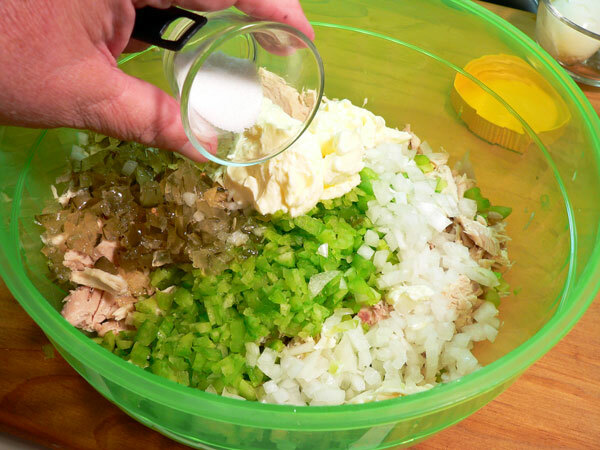 Follow these step-by-step, photo illustrated instructions for making our old-fashioned, homemade Chicken Salad recipe. We’re making it from scratch, the way mama use to make it and, you’ll find it’s pretty simple and easy to do. It’s a true southern cooking favorite that makes a great sandwich for a quick and easy meal. Printable recipe included. 1 Boiled Egg, chopped fine. Chop chicken as desired and place in a medium size mixing bowl. Wash celery stalks under cool water, chop very fine. 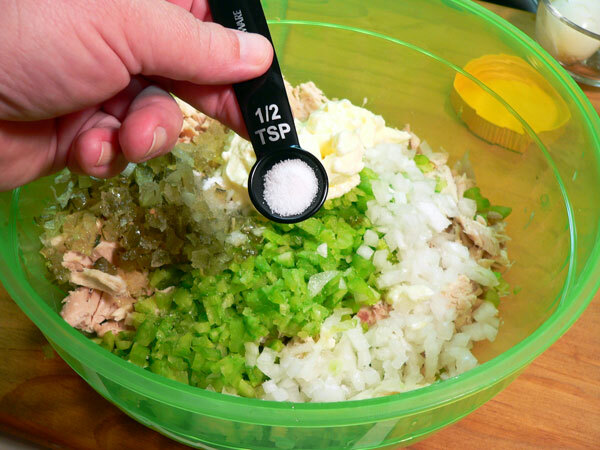 Add chopped celery to mixing bowl. Add a little sugar if desired. Add the chopped boiled egg. Stir mixture well, cover and refrigerate for at least one hour prior to serving. Your Comments: Have you ever made Chicken Salad from scratch? What other items do you add to your recipe besides what we offer here? As always, I look forward to reading your comments on any of our recipes. 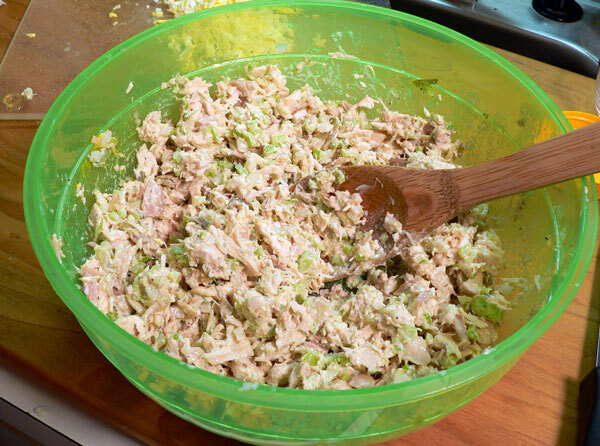 It will only take a minute or two of your time while you’re here so, please share your Chicken Salad recipe memories with us in the Comment Section below. Please know that all comments are moderated. That just means that I personally read each and everyone of them before they are approved for our family friendly website. I also try to respond to your questions and comments as time permits. So, share your thoughts with us and then check back later for my reply. Subscribe To Our Newsletter: We post a new recipe each Monday here on Taste of Southern. I also try to send out a weekly Newsletter to the subscribers of our site as a reminder that a new recipe is posted or, to keep you up to date on anything else that might be going on with us. It’s absolutely FREE to subscribe and will only take you a minute. It’s even easier to unsubscribe should you ever get bored with us. But, how could that happen… right? You’ll find a signup box below and there is one in the top right hand corner of each page. I’ll be looking for you. Thank you in advance for all of your support and for sharing our home on the Internet with your family and friends. I hope you’ll visit with us often. This is the perfect Southern Chicken Salad. Like my momma used to make! I added another half cup of Mayo, Black Olives, and some Celery Salt and man did this just POP. Thank you so much for this delicious treat! Hi Steve! Lucy from Texas here! Love your recipes and the stories you tell. I’ve made this chicken salad recipe several times now, and I don’t change a thing! I’ve gotten many compliments on it too; it’s superb as is (giving you full credit of course :() I’ve also made your salmon patties (during Lent) for my elderly mom, she raved about them! She makes a great tuna cake and salmon cake too, but she really liked these as well, as do I. I was wondering if you have a ham salad recipe for left over Easter ham? Can you please devise one, and post as I’m sure it would be awesome. Again, thanks for all the great recipes. I look forward to trying many more! What she said;) I second that Lucy Terrier. Would love a made-from-scratch ham salad recipe, Steve, if you have one. Thanks Bill! Hopefully a ham salad recipe will be forthcoming! I’ve tried making my own versions of ham salad, but they always seem to be lacking. That is why I’m hoping TOS can post one that is better than my poor attempts! this is exactly how I make my chicken salad which is how my mother did .I also use the chicken broth to make chicken noodle soup to go along with the chicken salad sandwiches. This is a great recipe. The only things i change is not use raw onion because my wife can’t have them and I use fresh squeezed Lemon to brighten it all up instead of Salt. I don’t add sugar either. Works with Chicken, Turkey as well as Tuna. This chicken salad recipe is similar to one I’ve been making for years with a couple of exceptions. I add finely chopped olives, use a mixture of sweet AND dill pickles, use dijon mustard instead of plain, leave out celery. This chicken salad is perfect. Tastes like the chicken salad from my youth. I’ve prepared it at least 6 times and the only thing I did different was add 3/4 cup mayo instead of 1/2. This one’s a keeper! Delicious! Add half a diced apple! This is a favorite recipe for me. The only thing I do is cut down on the sweet pickles and don’t use any juice. That makes The recipe less sweet, which I prefer. I tried your Chicken Salad and my family loves it,I did use sweet cubes and more egg but it was still delicious Thank you for the Recipe. 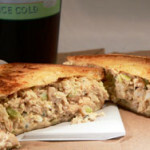 When I lived in Alabama my boss made her tuna fish very close to this with the egg, mayo, sweet pickles. Is your sweet pickle recipe listed? I miss her pickles so much! They were amazing! A little celery seed. 1/2-1 teaspoon. I add it to potato salad too. But I’ll make it your way first and for my second helping add the celery seed. I grew up in Nebraska, as did my mom. I’ve always sworn we were southerners in a previous life. Other than the fact I do add grapes and pecans, and use Hellman’s (no Dukes in Nebraska) mayo….this is exactly how my mom made it. Put the chicken salad on a warm croissant a few pieces of lettuce,and I’m in 7th heaven! Do you know if this is something that I can make ahead and freeze and small portions that I can take for lunch later? That’s what I was hoping to do this recipe looks really good though I think I’ll add some dried cranberries at the end. I’m just really hoping I can freeze it ahead so that I can take it for lunches. 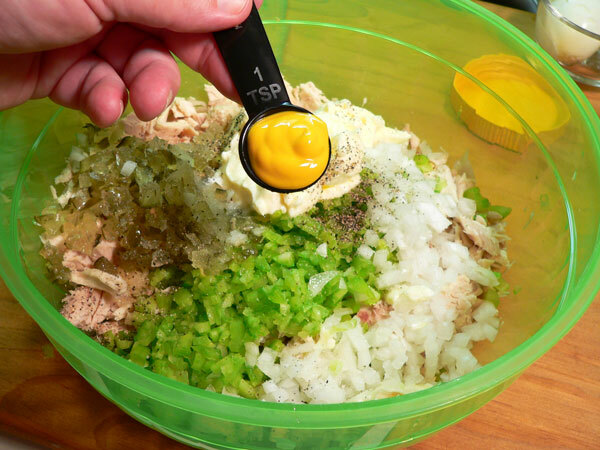 You can freeze mayo based chicken salad if the amount of mayo used is light – just drain the chicken salad once thawed, add a bit fresh mayo, salt & pepper and it freshens right up. I’m originally from Alabama, moved to the Midwest. Your recipe is a taste of home. I make it the same way, with sweet pickle relish. Thank you for posting it. Not telling you how to make your chicken salad, but, will give you a suggestion. I had seen this on the Ruth Lyons tv show out of Cincinnati when I was a kid. She had someone on there that was in love with peanut butter, she suggested adding some to chicken salad. I had to wait until I grew up to make it and strongly suggest everyone give it a try. You don’t taste the peanut butter but it sure boosts the taste of the chicken salad. I have converted a lot of people by suggesting they give it a try. Please do just one time. My mom used to do pretty much as you do, but always added Tarragon. Don’t have an exact measurement. I do about a teaspoon but add more to Taste later after the flavors meld. I MUST have my tarragon flavor! I’m from Guatemala and I just make it for a family lunch and they love it! I only made a change, didn’t use Sweet Pickle instead use Sweet Corn, but all the same was delicious, thanks for sharing the recipe! Your website is very pleasant, and you write very warmly. My addition will change the taste but is great for a change of pace. Instead of the pickle juice use the juice from some pickled peppers. Do not use any of the peppers – it would overwhelm taste of the salad. I hope to use many of your recipes. I just made this and it’s fantastic. I have just moved to Kansas from Louisiana and I am missing good food so much. The Midwest is where flavor doesn’t live apparently. I knew I was in trouble when I searched for the top places to eat in Wichita and they are mostly chain restaurants. So I am left to my own devices which is fine because I was blessed with a family that taught me how to cook. Chicken salad was readily available and quite delicious in Louisiana stores so I have never made it from scratch. This recipe was just what I was craving. Thank you for sharing. Try Piccadilly’s Market and Grill. They have everything there. Mediterranean to comfort foods! Can you use just boneless chicken breast or thighs to make the chicken salad? I added a jalapeño pepper. I used the blender tried pulsing but it came out more of a dip. I had some tortilla chips and it is so good. I used paprika, garlic powder, salt, lemon pepper, and pepper. I did use a hard boil egg, celery,onion, and dill pickles. Oh mayo and a little mustard and chicken breast. It is delicious. I’m not a cook. My husband just sent me to the grocery store today for parsley and garlic and I had to call him to ask him what parsley and garlic looked like. So, yeah, I’m THAT bad. 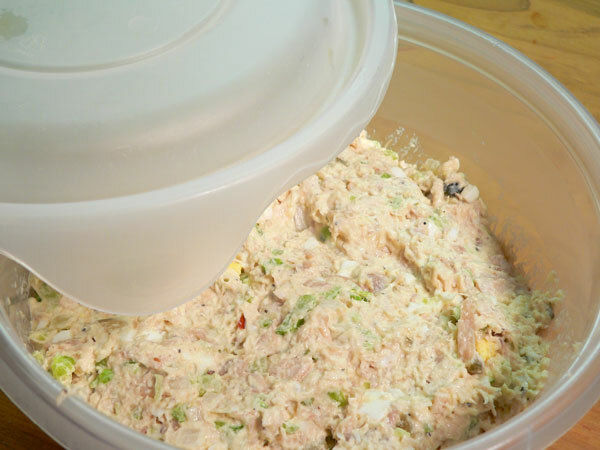 My grandfather used to make chicken salad sandwiches for me and I’d never been able to find pre-made or restaurant chicken salad that was equal to what he made. UNTIL NOW. This was so simple even I could put it together and my husband (the cook in our house) LOVED it. He called me out of the blue today to say how much he loved it and to ask if I wouldn’t mind making it regularly so we could always have some in the fridge to snack on. THANKS FOR THIS!! My only question is why would anyone ever alter this recipe? I made this for the first time tonight, and it was divine! I was born and raised in N. Carolina and now live in the state of Washington, and let me tell you, they just don’t eat right over here. You can’t even get Duke’s mayo! Country ham? Forget it. Sweet tea? Forget it. Please don’t judge me because I had to use Best Foods mayo, but I had no choice. Thanks for the recipe, Steve! Keep ’em coming! This recipe sounds awesome! It really took me back as well to the drugstore counter sandwich that my mom would take us to and order chicken salad sandwiches made with toasted white bread and wrapped in wax paper. Maybe there were some Lay’s ridge cut potato chips on the side. We always had these with cherry coke served from the fountain. I can’t wait to try this recipe! I think the drug store is still operating today or at least I hope so. One thing that caught my eye was the texture of this chicken salad. It doesn’t look too chunky or too minced. When I lived up north I swore off ever eating the stuff as it was basically cubed chicken with some celery and mayonnaise. There was not really anything there to bring it together like the southern version here and the one I so fondly remember. Thanks again Steve! My Eastern NC grandmother (Kinston) would be okay with this recipe, except for the mustard and egg. She also squished up her chicken meat (the whole chicken) by hand until it was finely mixed. I’ll be substituting, and this is a cardinal sin, Japanese mayo for Dukes. I’m getting ready to fix this for a party (in PA Dutch country), so thanks for posting the recipe, Steve, and refreshing my memory of Grandma Lucille! 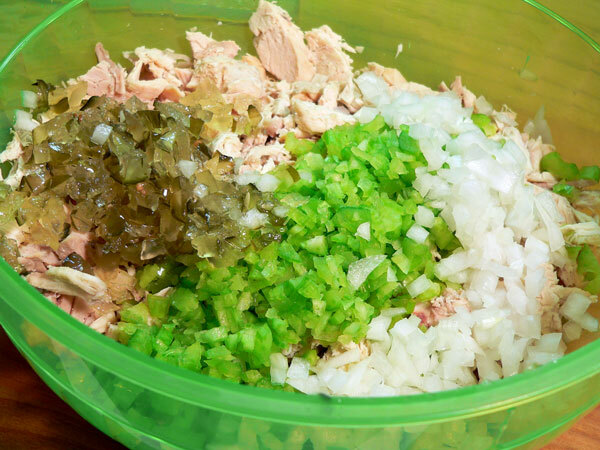 Hi, I’ve done this recipe trying to find a recipe identical to our local bbq joints chicken salad, I found this didn’t have that sweet flavor to it, but everything else seemed perfect. Do you think miracle whip could fix that? Or should I just add some to the mayo? Also my chicken salad came out yellow, could I prevent that by using egg white only? Have you ever tried it with a different mustard variation? Love the recipe, it’s helped bring me closer to the secret recipe I’ve been searching for.thank you!!!! This tastes exactly like the chicken salad I grew up eating. I had forgotten how good it was! This blows all the fancy chicken salads out of the water. Thanks, Steve. I look forward to exploring your other recipes. This tastes exactly like the chicken salad I grew up eating. I had forgotten how good it was! This blows all the fancy chicken salads out of the water! Thanks, Steve. I look forward to trying your other recipes. Loved this recipe! Just like Granny used to make. Simplistic but perfect in every way. I knew you were the real deal when I saw Dukes and mama’s sweet pickles!! 🙂 Subscribed and look forward to following you. There are so many variations of chicken salad out there, but I was looking for the basic southern recipe that has been used in my family forever. My family comes from Wilmington and this looks pretty much like the recipe my Grandmama made and my Mama after that. I don’t think they used mustard or sugar. I knew I had found the right webpage when I saw the jar of Dukes! That stuff could be $10.00 a jar and southerners would keep right on buying it! Thanks for the recipe, saved me from digging out the recipe box. I am familiar with this recipe. My mother and grandmother taught me how to make this many years ago. The only difference is that I use Kraft mayo and I add pecans. Being from Alabama and a little nutty already, we just think the nuttier, the better! Hi, Steve! Looking at “different” ways to make chicken salad & came upon your recipe. Being a southern girl it’s pretty much how I make mine, although I’ve never added mustard. Looking forward to trying that. I occasionally will add some capers to my chicken salad. Also sometimes a good pinch of tarragon, just because I like tarragon! Looking forward to exploring your recipes. Excellent photos, too! I always buy my chicken salad from a little market in Henderson NC called Supply Line because I was never able to replicate it……until now that is! I love your website and will be back frequently. It’s hard to find true southern recipes online that taste like what I grew up eating. Love this recipe I made it without the eggs and I still loved it so yummy! It was my first time making chicken salad without grapes, my fìance likes it with relish so I’ll be doing this again. Thank you so much and God bless. Hi. Would this be ok if I left out the egg? Can you tell me approximately how much this recipe makes? I see that it says 6-8 servings, but just how large are those servings? Or how much does it make total? I am trying to scale it for a large audience! I made this for my family! It turned out VERY VERY good! I made myself a separate Tupperware bowl of it and added raisins and chia seeds…LOVIN’IT!! I WILL be eating this very often! Especially on toasted onion bread! 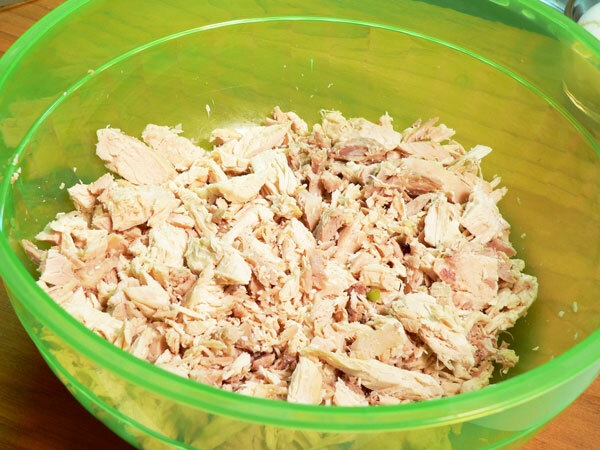 Pretty basic chicken salad recipe. Nuthin’ all that special about it, but nuthin’ wrong with it either. Love your VERY precise photos and instructions. Might try adding a couple of tablespoons of good quality olive oil to loosen it up a bit- adds flavor and makes it a little more spreadable. And offsets some of the carbs from the added sugar with some unsaturated fats. Hey that’s Southern- Southern Italian anyway. You want to make it even more healthy there are things you can throw in, like slightly under cooked green peas or almond slivers etc. But your pure unadulterated version is delice. +1 on the Duke’s. Olive oil? Undercooked peas? Oh honey. Made this today, was pleasantly surprised at how awesome it was. Nice to have chicken salad that actually tastes different and has that old fashion appeal to it. Thanks!! Just wanted to drop you a note to say this recipe is absolutely delicious!!! My husband and I just made it for lunch today and are thrilled!!! On white toast with crunchy romaine lettuce-fabulous!!! Thanks again and keep those recipies and dishes coming!!! Southern Gal from San Antonio (transplanted to Ventura)!!!! My mother bought me a can of chicken and REQUESTED, lol that I make her some chicken salad. I have browsed this internet for over 30 minutes looking for an old fashioned recipe. This reminded me of how I used to make tuna salad minus the mustard. Thanks for posting. I will now go get my celery and get started. Went to the pool today with this recipe I made last night. Family loved it. Thank you for a great recipe. I lived in Goldsboro, NC for most of my childhood. My mother was an excellent southern cook; nothing fancy, just wonderful flavors. I was delighted to find on “Taste of Southern” recipes for both chicken pastry and chicken salad. My mother’s recipes were lost to me. Your’s sound just like what I remember and I have never tasted any better than my mother’s in the case of either of these two dishes. Although she does not claim to be able to duplicate our mother’s chicken salad, my sister believes that the key ingredient is Dukes Mayonnaise. I am seriously looking forward to trying your recipe. I am almost drooling now just thinking about grilled chicken salad sandwiches! Two of my mother’s secrets for chicken pastry were: 1) she always bought a baking hen because she said the broth needed more fat than you would get from a fryer; I’m not sure baking hen’s can be had any more, but I’ll give it a try; 2) she tried to roll out her pastry dough as thin as possible so that it was almost translucent. Thanks!!! I am looking forward to exploring the other recipes on “Taste of Southern”. HI STEVE, I MADE THE CHICKEN SALAD RECIPE FOR MY FAMILY LASTNIGHT FOR DINNER, AND IT TURNED OUT TO BE DELICIOUS!!!!!!!!!!! WE LOVED IT!!!!! THANK YOU SO MUCH!!!!!!!!!!!! Everything I’ve made on this site is so great. I can’t wait to see more of what’s coming. excited. Hi Steve, I found your website today because I happened to post on cooking black-eyed peas and found your field peas recipe and linked to it and your website in a comment back to a commenter asking how long to cook peas. So here I am perusing other recipes and love the sound of this chicken salad! My recipe is almost the same although I’ve never used an egg in mine. A little restaurant down the road from us specializes in chicken salad and grills their chicken so their salad has a grilled chicken salad taste. Very yummy, too. Thanks for your site. I’ll be back! Hi Deb, I’m very thankful that you found Taste of Southern and greatly appreciate the link from you website. I had to check it out of course, and loved the story about Granny and her baskets. She’s a lovely looking lady and I hope the sale turned out great. Looks like there is a lot of talent in your family and I hope our readers will check out your website as well. The grilled chicken salad sounds like it would be very tasty. Anytime we grill chicken around here, there is never enough left over to make chicken salad with it. Rotisserie chicken from the grocery store makes good chicken salad as well. I made chicken salad wraps for dinner last night (it has just been too hot to turn on the oven). I had roasted a chicken over the weekend and used the rest of it up. 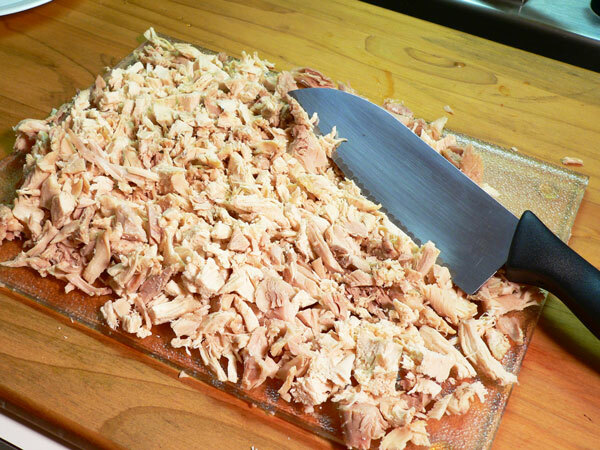 I tend to shred the chicken rather than cut it up. I, too, use onions, celery, eggs, just a touch of mustard, and pickle relish. I was raised in a house that was miracle whip only (I can hear the gasp), but last night I had just a little left in the jar so I subsidized it with duke’s that was leftover from a cookout a couple of weeks ago. If you use miracle whip you don’t have to use sugar. Besides the salt and pepper I also add some parsley — because I like it. I had three large tortilla wraps left over from another recipe that I wanted to use up so I placed the chicken salad, a quick red onion pickle that I got off the Internet, and a mix of arugula and butter lettuce over the chicken and rolled it all up. Cut the wraps in half and placed one diagonally to the other and it looked like something very chic (but it was just good ‘ol chicken salad). « Chicken Pastry Recipe, made from scratch.